Preheat oven to 350 degrees. Line a baking sheet with parchment or a Silpat liner. Although you don’t need to grease an unlined baking sheet, I find using a liner makes clean-up much easier. In a medium bowl, whisk together the flour, baking soda, salt and cream of tartar. Using an electric mixer, cream together the butter, granulated sugar and light brown sugar in a large bowl until light and fluffy. Add the eggs and vanilla. Mix well, scrapping down the sides of the bowl occasionally. Add the flour mixture and mix on low speed until the flour is almost incorporated. Add the chocolate chips and nuts (if using) and mix on low speed until everything is evenly incorporated and no trace of flour remains. Drop by rounded tablespoonfuls about 2 inches apart. Bake for 11-13 minutes until light golden brown on the bottom. Cool on the baking sheet for 2 minutes and then remove to a wire rack to cool completely. 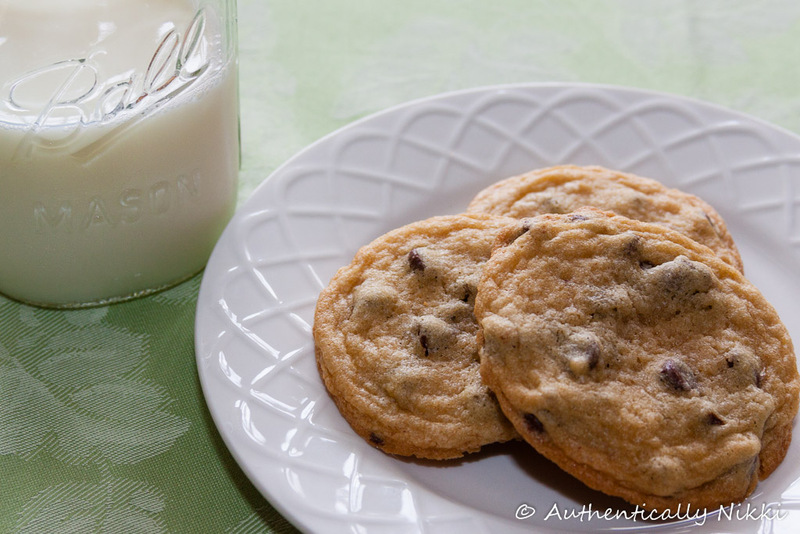 This entry was posted in Cookies, Food and tagged chewy, chocolate chip, cookies by authenticallynikki. Bookmark the permalink.